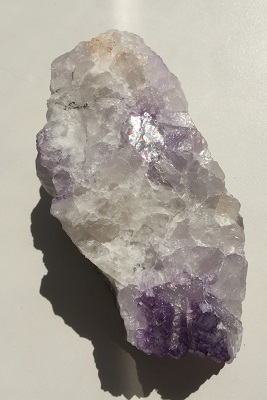 Natural dark grape purple colored Fluorite crystal with a flashy rainbow on a beautiful snowy white Quartz crystal matrix from Mexico. 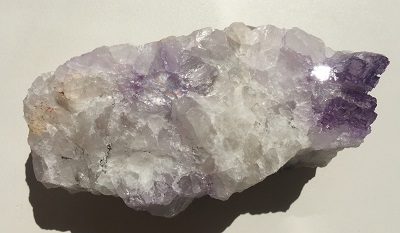 This stunning crystal specimen combines the energies of Purple Fluorite and amplifies them with the presence of the Quartz Crystal. 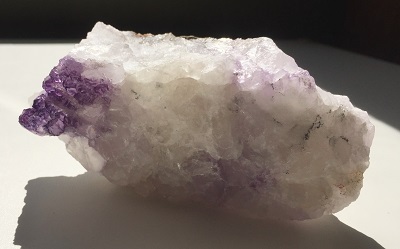 Fluorite is highly protective stone, especially on the psychic level. Purple Fluorite stimulates the third eye chakra and imparts common sense to psychic communication. It is an excellent meditation stone. Fluorite helps you discern when outside influences are at work within yourself and shuts off psychic manipulation and undue mental influence. This stone cleanses and stabilizes the aura. Fluorite cleanses, purifies, dispels and reorganizes anything within the body that is not in perfect order. Fluorite is the best crystal tool to use in overcoming any form of disorganization, busting through the procrastination, and helpful in the reorganization of the physical, emotional and mental bodies. Fluorite grounds and integrates spiritual energies, promotes unbiased impartiality and heightens intuitive powers; making you more aware of higher spiritual realities and quickening spiritual awakening. In healing, Fluorite is a powerful healing tool, dealing with infections and disorders. Fluorite’s energetic vibration benefits teeth, cells and bones and may be helpful in repairing DNA damage. As an elixir, Fluorite is powerful against viruses, beneficial against colds, flu, and sinusitis. Dissolving adhesion and mobilizing joints, Fluorite alleviates arthritis, rheumatism, and spinal injuries. Fluorite may provide pain relief and relief from the discomfort of shingles and other nerve-related pain. 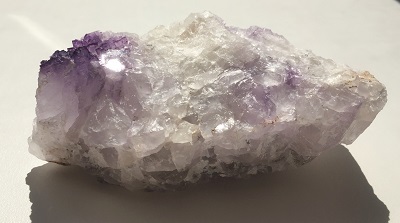 Purple Fluorite may be useful in the treatment of bones and bone marrow disorders.